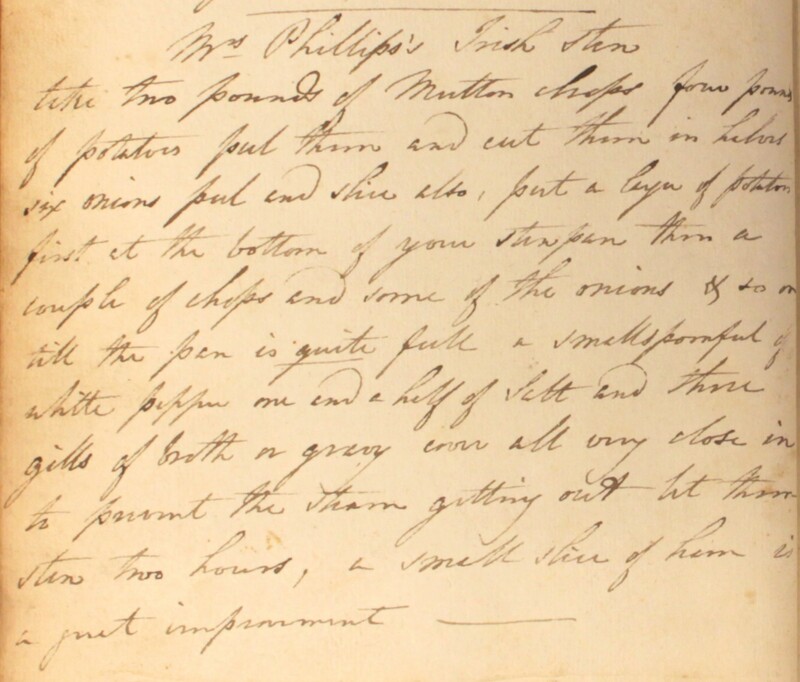 This recipe for honey wine, or Irish sack, is among the earliest in our Cookbook. Water (river water) and honey are boiled and ‘scummed’ for three hours. Once cooled, the mixture is left for a couple of days until any solids have settled and the liquid can be poured off into a cask. And then there’s a further six months of brewing time until the wine can be finally bottled. It is time-consuming, but simple, and the instructions are unusually thorough. There’s even a tip about stopping mice getting to the drink before you do! Take what quantity of river water you please. Mix honey with it till it will bear an egg [so] that the end appears a little above the water. Keep out a little of your liquor in a convenient pot or kettle, and as it boils up put in a little of your cold liquor to make the scum rise […] better and prevent its boiling over. Scum it clean and so continue to do for two hours as the scum rises. 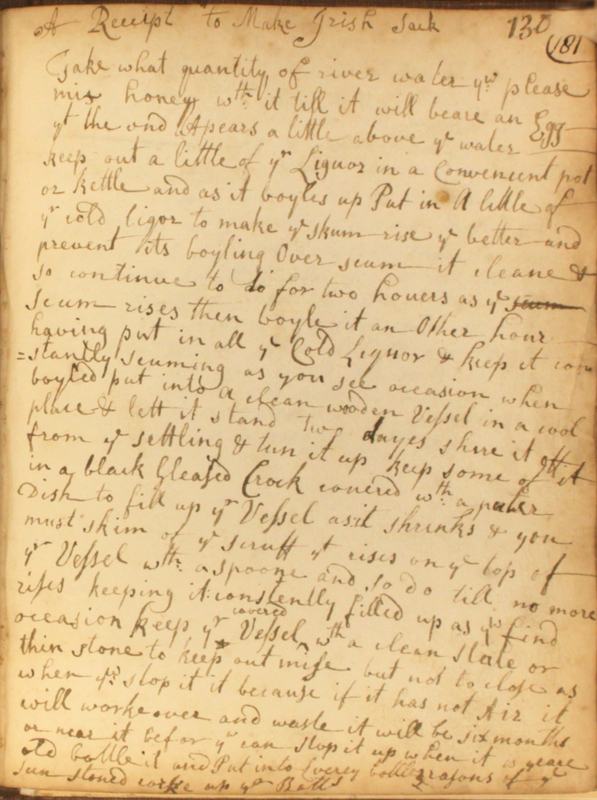 Then boil it another hour, having put in all the cold liquor, and keep it constantly scumming as you see occasion. When boiled, put into a clean wooden vessel in a cool place & let it stand [for] two days. [Separate] it […] from the settling and [put it in a cask]. Keep some of it in a black glazed crock covered with a pewter dish to fill up your vessel as it shrinks, & you must skim of [the] scruff that rises on the top of your vessel with a spoon, and so do till no more rises, keeping it constantly filled up as you find occasion. Keep your vessel covered with a clean slate or thin stone to keep out mice, but not too close as when you stop it because, if it has not air, it will work over and waste. It will be six months, or near it, before you can stop it up. When it is [a] year old, bottle it and put into every bottle 3 [stoned raisins]. Cork up the bottles. No cold liquor to be put in the third hour. It will waste a third part in the boiling. Of course, if you do decide to try this one at home, please don’t use river water. Tap water may lack a little in authenticity, but is a much safer option! ½ lb black rosin, same of red sealing wax, quarter oz of bees wax melted in an earthen or iron pot. When it froths up, before all is melted and likely to boil over, stir it with a tallow candle, which will settle the froth till all is melted and fit for use. Take two pounds of mutton chops, four pounds of potatoes. Peel them and cut them in halves. Six onions peel and slice also. Put a layer of potato, first, at the bottom of your stewpan, then a couple of chops and some of the onions & so on till the pot is quite full, a small spoonful of white pepper, one and a half of salt, and three gills of broth or gravy. Cover all very close in to prevent the steam getting out. Let them stew two hours. A small slice of ham is a great improvement. Take part of a neck of mutton. Cut it into chops. Season them well. Put it into a saucepan. Let it brase for half an hour. Take two dozen of potatoes, boil them, mash them and season them. Butter your mould and line it with the potatoes. Put in the mutton. Bake it for half an hour, when it will be done. Cut a hole in the top and add some gravy. With its mashed potato crust, this dish is more commonly known to many of us as Shepherd’s Pie. The potato had been introduced to Ireland in the mid 17th century as a delicacy for the gentry. By the early 19th century it was eaten by people of all classes, and was the staple food of the Irish poor. 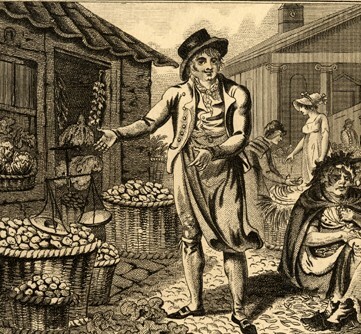 Irish dependency on the potato had become a national stereotype by the early 1800s, as demonstrated by the popular song The Yorkshire Irishman or the Adventures of a Potatoe Merchant. The song tells of a Yorkshireman who learns from his mother that he is the son of an Irish potato grower. The song ends making a living for himself as a potato merchant in Covent Garden Market. Hard-drinking and with the gift of gab, his successful potato business sees him fulfilling the cultural destiny supposedly prescribed by his alleged parentage. Ireland’s reliance on the potato as the staple diet of its working poor meant that the population was extremely vulnerable to harvest failures. 28 years after these recipes were first published, a new type of potato blight ravaged Ireland’s potato harvests. Over the following decade, over 1 million people died as the result of blight, and yet more fled the famine, leaving the country and their livelihoods behind.